In order to be employed or to be admitted in your dream school, you need to apply for a job. This means countless of numbers of printed papers will be produced for your application letters. 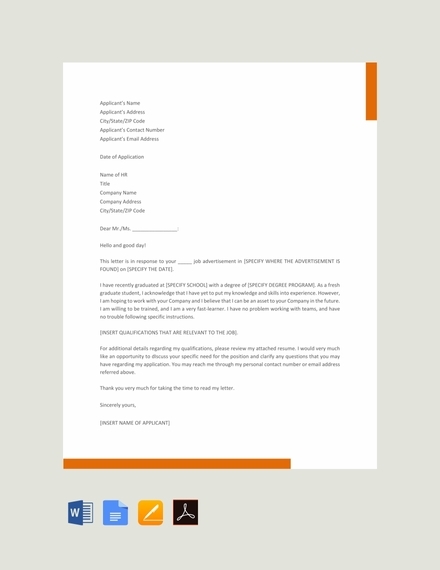 Application letters are necessary tools every company requires for job applicants. Through the submitted application letter, the employer can easily determine if the applicant is qualified for the vacant position in the company. 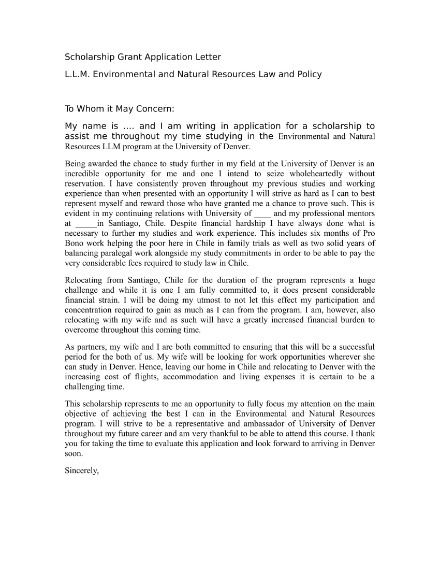 Learn more about application letters to help you get accepted to your dream job or institution. Personal information: An application letter is useless without information about the sender/applicant. The personal information of the applicant should include his/her name, address, and contact information. 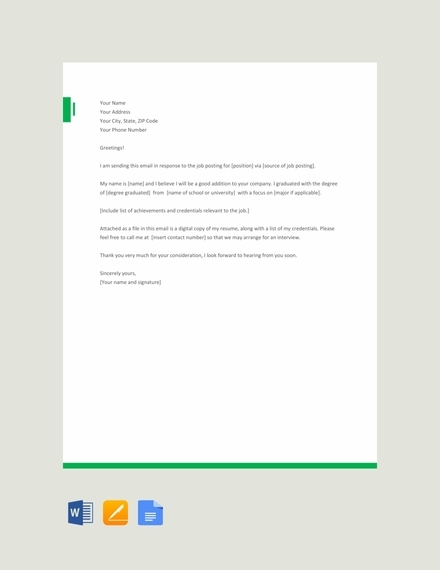 This will somehow serve as the return address or letterhead of the application letter. Date: For the company’s record and tracking purposes, as well as yours, the date when the letter was written should be included. If this was the same date when you submitted the letter, this will help you keep track of how long the company takes to reply to your application. 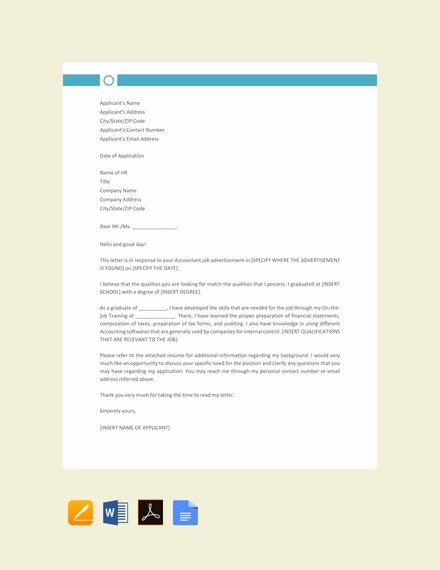 It also allows the company to see you have an updated application letter. Receiver’s information: Since this is a letter format, you also need to include pertinent information about the receiver/ employer or the inside address. This should include the name and title of the immediate receiver, company address, and contact information. Formal greeting: Following the formal letter format, there should be a formal greeting on the first part of your letter. This part is also called the salutation. The salutation of the letter includes the commonly used salutation Dear followed by the recipient’s title and given name or last name. 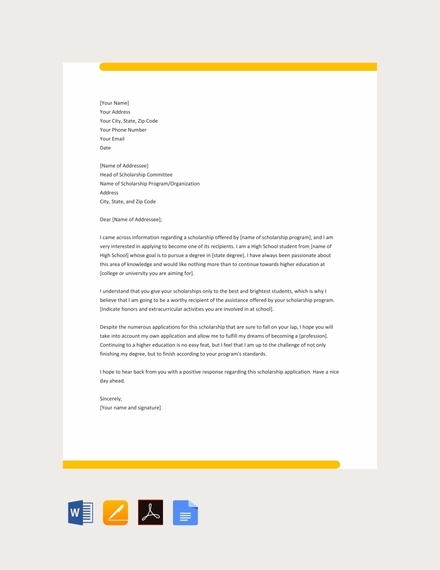 Introduction: The introduction of your application letter should immediately mention the purpose of the letter. Aside from that, you should also mention where you got the information about the job posting. You should discuss the most important information about you that makes you a good option for the position, e.g. what college degree you graduated with, what experiences you have, and so on. Supporting details: In the following paragraphs of your application letter, you should be able to present details that support your self-introduction. Your supporting details will allow you to further persuade your future employer to give you a spot for an actual interview. It should also highlight and give emphasis on your qualifications for the job. Conclusion: The conclusion of your application letter should encourage your employer to take an action; a call-to-action, to be precise. This also convinces your future employer that you actually have interest for the position that you are applying for. 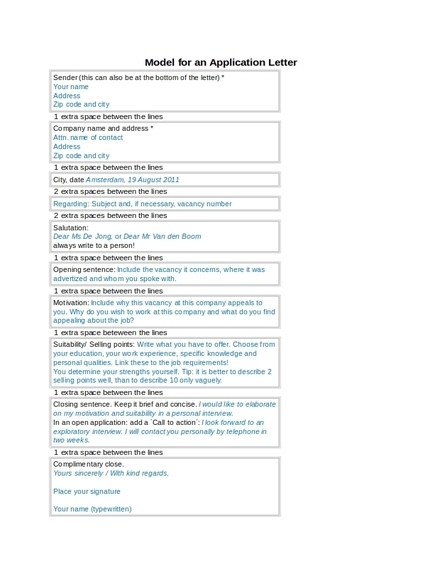 Signature line: Before the signature line, a complimentary close indicating your cordial attitude toward the whole application should be written. Your signature line should be two to three spaces below the complimentary close and should include your printed name, title, and/or contact information. Just like any letter, it is important to indicate the correct return and inside addresses. 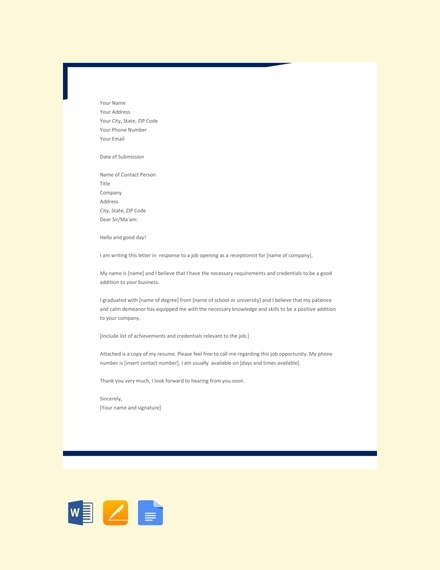 Depending on the formal letter format that you are following, your return address can be justified to the left or right or can be on the center top as a letterhead. Regardless of format, however, ensure that the information you include and the date are accurate. The salutation of your application letter should be aligned with inside address; this means it should be justified to the left. Same as in any letters, your salutations should be courteous and professional. Make sure you use the actual name you are addressing the letter to. Avoid using the general salutation Dear Sir or Madam or To whom it may concern. As you write the introduction of your letter, make sure you immediately make it known that you are interested to apply for the job post. Aside from that, you should also include your most important credentials and experiences that you think makes you qualified for the job. Don’t sell yourself short, but also avoid including untruthful claims. Since you have presented your major credentials or experiences on your introductory paragraph, you need to provide further information that supports what you have presented. On your second and third paragraph, make sure you provide pertinent information that would make true to your previous claims. Just make sure you organize your information in a coherent manner. On your last paragraph, you can add a call-to-action as your conclusion. This means that you provide statement that would encourage your reader to act on your application. Including a simple “I look for ward to speaking with you” can convince your reader to give you callback since you have displayed enthusiasm and interest through your call-to-action. The complimentary close and signature line should be aligned with your inside address and salutation; this means that both should be on the left side of the paper. Aside from that, you need to make sure you maintain the professionalism in your letter down to the complimentary close. Also make sure your name is printed out on the signature line. Do your research about the company or institution. Do not repeat your resume; avoid using the same contents in your resume in your application letter. Tailor your letter to every position and company you are applying for. Briefly summarize your strengths, qualifications, and experience, but highlight only relevant ones. Talk about how you can help the company or institution. Choose information that will make you stand out from other applicants. Follow the proper formal letter format. Keep it short but well-informed. Affix your real signature on the signature line. 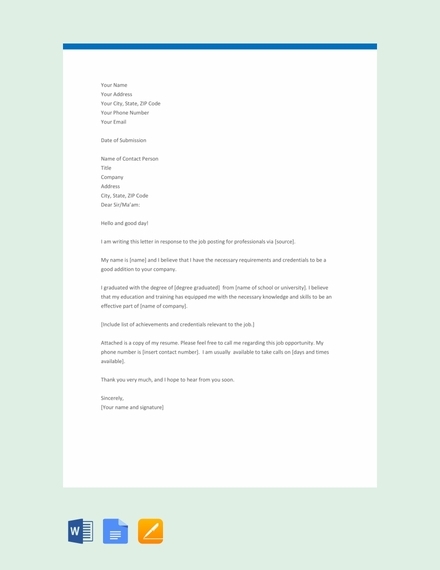 As the mane would suggest, a solicited application letter is sent in response to a job posting or job advertisement. 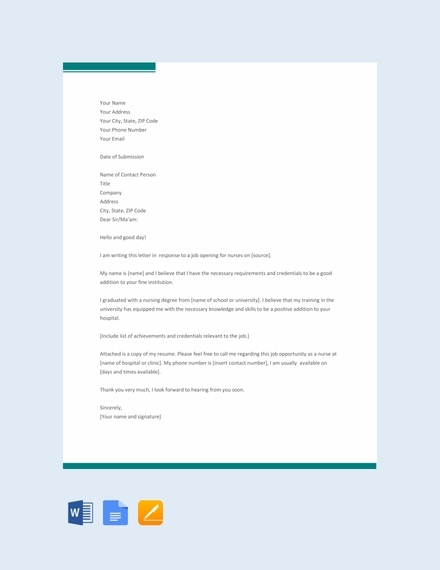 The letter is sent because there is an intent for the company to hire a new employee or that there was an announcement about accepting new students or interns. 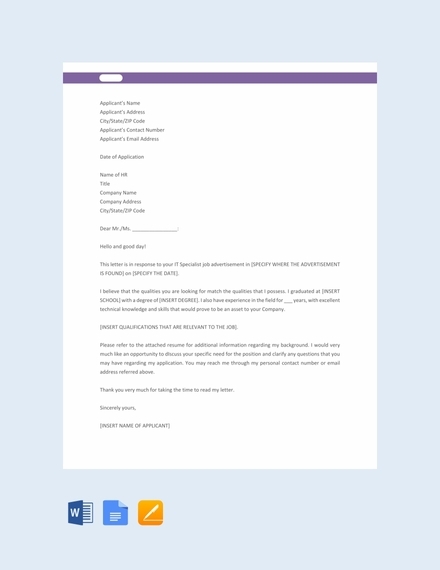 Either way, the first requirement for this application letter is to specifically mention where the applicants saw or heard the announcement. 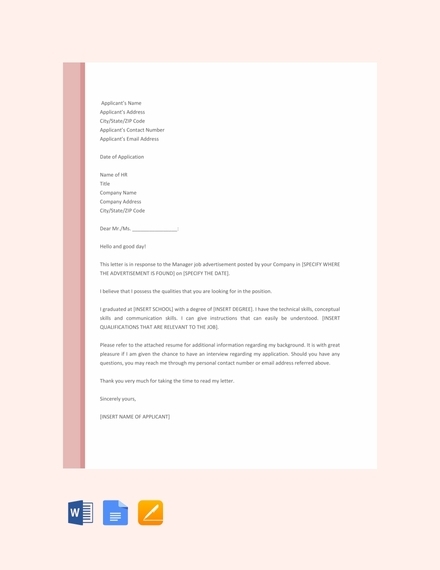 On the other hand, unsolicited application letters are sent to companies or institutions without knowledge if there are any vacant spots to fill in. These letters have advantages against a solicited one because (1) it can be sent at any time, (2) you can define what position you want, and (3) there is less competition since there was no public announcement. But you have to remember to address the letter specifically to the person you intend to receive it. There is no specific size intended only for an application letter. 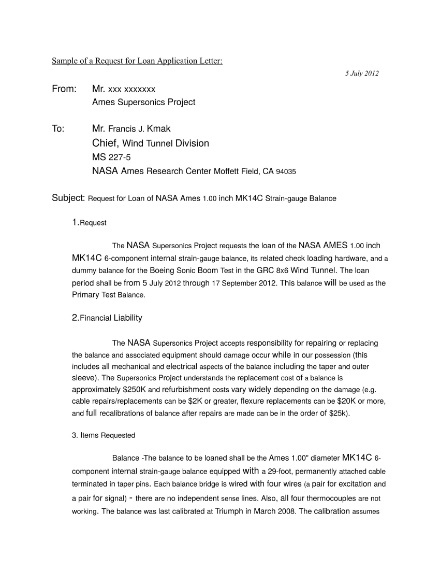 However, since this is still a formal letter, it needs to follow the standardized size for the the paper to be used, which is 8.5″ × 11″. 1. 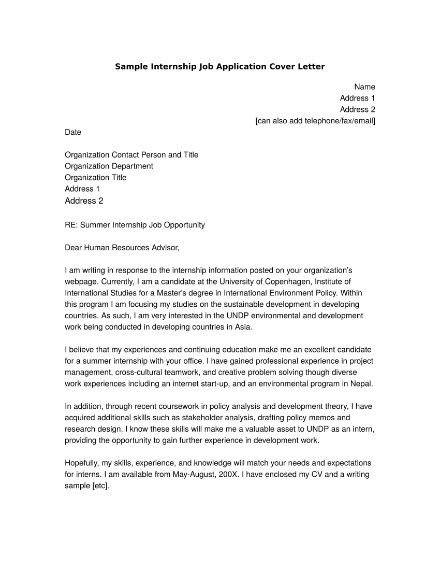 What is the purpose of an application letter? 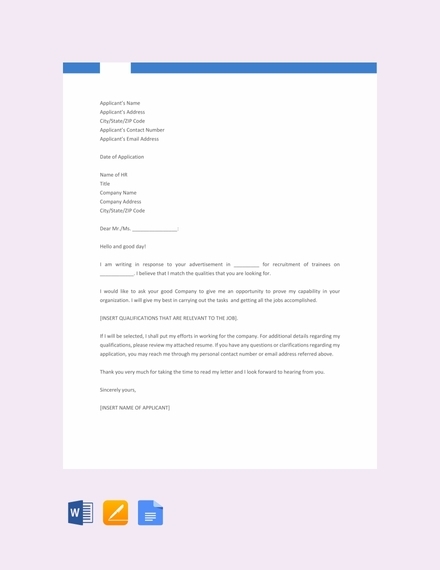 The purpose of an application letter is to formally introduce yourself to the company or institution you are applying for. In addition, it also conveys your intention to apply for a vacant position. Furthermore, it helps you draw attention to the resume you attached and highlights your qualifications. 2. 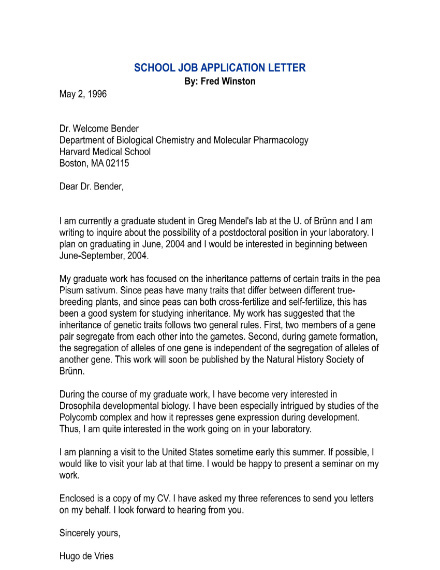 What is the difference between application letter and cover letter? There are only subtle differences between the two. An application letter is intended to generally stand on its own while a cover letter needs a supporting document, a CV or resume. But they are both used for the same purpose: to introduce the sender and to convey his/her purpose or reason for writing the letter in the first place. 3. What are the contents of an effective cover letter?